Oftentimes, situations arise when a company handles several types of chemicals. The containers may be individually marked, color coded and warnings posted to keep the chemicals separate. However there is a possibility that accidentally, someone transfers the wrong chemical from one container to another resulting in hazardous mix ups. Use of Dry Link’s keyed couplings can be a fool proof solution for avoiding cross contamination of chemicals. • Prevent accidental connections and cross contamination. • Matched sets of couplers and adapters with mechanical keys. • Keyed units will not latch onto standard non-keyed units. • Used in batch process plants & manifolds for preventing cross-contamination of fluids. 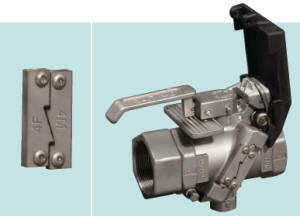 • Mechanical interlock allows only a matching coupler and adapter to be connected. 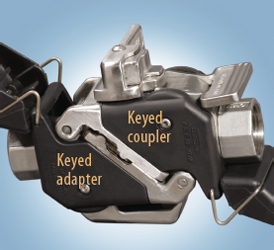 For a particular key code, custom-machined matched couplers and adapters can latch only onto each other. Coupler keys are designated as 1C, 2C, 3C, etc., and adapter keys as 1A, 2A, 3A, etc. So a coupler stamped with key 1C will connect only with an adapter stamped with key 1A. When ordering, please specify key code numbers of your choice. For 2, 3, and 4 inch size couplings, each coupler and adapter of the set has an attached key on each side. of the body. Coupler keys are designated 1F, 2F, 3F, etc. and the adapter keys 1M, 2M, 3M, etc. These designations are stamped on the keys themselves. Keys are field replaceable. One key (for example, 5F) is fitted to the left-hand side and one (for example, 4F) to the right-hand side of a coupler to give the coupler a unique designation 5FL/4FR. The mating adapter for this coupler will have a unique designation of 5ML/4MR. Each combination is given a set code, in this case set code “T”. When ordering, please specify the set code of your choice.